If you haven’t discovered Pilates, you may be surprised to find that it requires an intense body/mind connection, but with no spiritual dogma as in Yoga. If you are looking for an effective way to strengthen and energize your body with an emphasis on core strength, improving your balance, and increasing your flexibility, Pilates may be just what you are looking for. Pilates in Seattle has become a popular low-impact workout. Participating in Pilates classes is a great investment in your health and well-being. Regular Pilates workouts will help you maintain a healthy weight and build self-confidence. Pilates is effective for building lean muscle, improving spinal flexibility, and reforming your posture. In the 1920s, Joseph Pilates developed the exercise system that carries his name. He first taught the Pilates mat to athletes and police officers. Later he developed the equipment to help as a rehabilitation program for prisoners of war who required an effective way to recover the strength and energy they lost during their long, sedentary time in captivity. Besides body-weight exercises and mat exercises, Joseph Pilates created special equipment to guide anyone who practices them through the proper range of motion until their body is strong enough to do the Pilates floor exercises. The added resistance on the equipment also energizes the muscles and gets fast results. 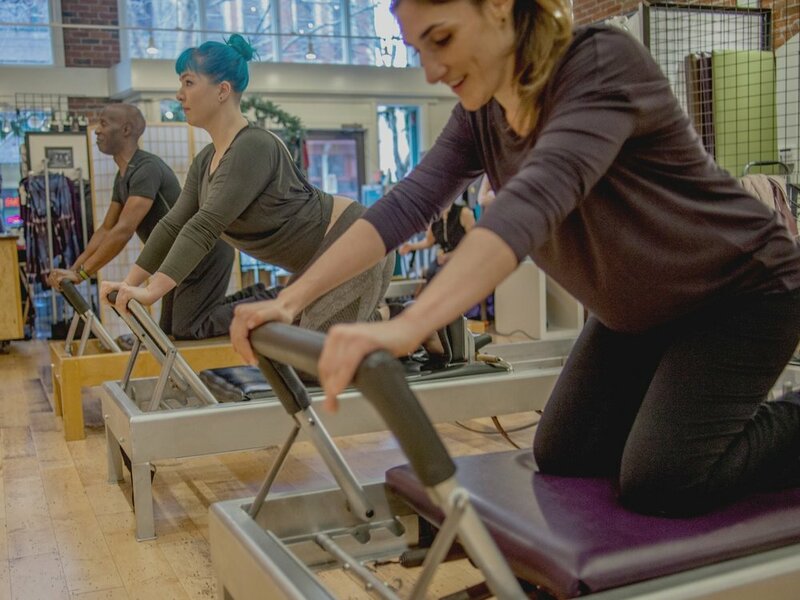 The classic Pilates piece is known as the Reformer and it consists of a sliding platform with springs at one end that is moved by pulling on leather straps or pushing from a stationary foot bar. How Does Pilates In Seattle Work? Pilates classes generally last from 50 minutes to one hour. You can either do them on a mat or with the special apparatus that your Seattle Pilates studio offers. The exercises and movements are full body movements that constantly change. The aim is for centering and precision using breath control. A beginner or rehabilitative workout is focused on body awareness, while advanced work is athletic with a focus on agility and perfect form. Kinesia Pilates offers personal training in Private lessons and personalized training in small group classes. We recommend starting in Private lessons for the fastest results. Our Fundamentals classes are perfect for beginners or more advanced clients talking an active rest day to refine their foundation. We also offer Mixed Level classes where the technique is not explained. These classes move faster and include more advanced exercises. To join Mixed Level classes it’s important to know how to do the exercises and use the apparatus independently to keep the flow of the group. What Benefits Does Pilates Offer? How Often Should You Schedule A Pilates Workout? To obtain the best results, plan on attending a class several times a week. Combining it with aerobic exercises or sports will give you the most all-around benefit. Pilates is considered strength training and increasing muscle mass helps burn calories. Weight gain is often associated with a sedentary lifestyle, over-indulgence, or being sidelined due to injury. Pilates classes will improve your strength, flexibility, posture, and help you feel more in control of your body. The result is more self-confidence and a new general conditioning practice to balance out what your body needs. Additional cardio exercises such as running, cycling, or swimming are will increase your results for weight loss. Private lessons are personal training in Pilates tailored to your needs and goals. In private lessons, you will learn at your own pace and focus on your own priorities. Get personalized training in a small-group setting. Learn how to get amazing results fast using the Reformer and Mat in small group Pilates classes. What Is The Best Way To Start Pilates? If you’re new to exercise and interested in exploring all the challenges and benefits that Pilates has to offer, we recommend starting in private lessons. In a private lesson, we meet you where you are and tailor your lessons to your learning style. You will work at your own pace instead of being tied to the group dynamic. Later, when you feel confident with the technique and equipment, we invite you to join small group classes at Kinesia Pilates Studio in Seattle. Since Reformers require tactical knowledge to use, one-on-one instruction is the best way to get started. On the other hand, if you’re a seasoned athlete, or you’re happy with the fitness level of your abdominal and low back muscles, we still recommend starting in Private lessons so you are confident with the technique and equipment. In the beginning, your lessons are designed for gaining better body control and strengthening a weak core. As you advance you will discover that regular Pilates workouts will bring you new agility challenges, while the full-body movements will help strengthen your weakest links and improve your flexibility. Pilates is much more than fitness, it is an interesting and sophisticated method that is adaptable to your needs and goals. As explained above, the Reformer is a bed-like frame with a sliding carriage attached to one end with a set of springs. These can be adjusted to provide different levels of resistance. There are also shoulder blocks on the carriage to stops you from sliding off as you push or pull. A foot-bar is attached at the spring end of the reformer. It can be used by your hands or feet as you move the carriage along. Long straps with handles are attached to the other end of the frame. These can be pulled with your arms or legs. To use the Reformer, you can lie, sit or stand on it. Exercises can be done to push, pull or hold the carriage steady while the springs provide the right amount of resistance needed. You strengthen the entire range of motion of your muscles as they resist the force of the springs. This is called eccentric muscle contraction and is excellent for achieving strong, flexible muscles. At first glance, the Cadillac looks more like a medieval torture device than a piece of exercise equipment. Standing about 6 feet tall, it consists of a bed with a mat on it and a three-sided frame going over the top and attached to either end of the bed. Attached to the frame are various devices like leg springs, arm springs, loops to hang from, a push-through bar and a trapeze. Because of its large size, many times the Cadillac is not used in group classes but may be included in private Pilates classes. The Cadillac can accommodate all kinds of stretching exercises, and you'll feel like a gymnast when you use it! Wall Units are the Cadillac without the entire frame. Kinesia Pilates in Seattle is equipped with three Wall-Units and a Cadillac and uses them both in small group classes. A 2-foot box with a spring-supported pedal on one side, this is Pilates done vertically. This is the most advanced piece of equipment and especially popular with athletes, cyclists, and dancers because of the challenges for strength, stamina, and balance. A turtle-like apparatus with a smoothly contoured arc and a small ledge on one side. This piece supports the spine in side-bends, back-bends, and shoulder stands. It is a delicious way to end a workout. You will also find many other classic Pilates apparatus at Kinesia Pilates such as the Ped-i-pole, neck-corrector, foot-corrector, toe-corrector, magic circles, and baby-chair. These are used most often in Private lessons as they are designed to target specific issues. If you want to try Pilates for the first time, an introductory private-orientation lesson is ideal. After your first private lesson, your teacher will make a recommendation on how to get the best results based on your budget and goals. Visit our Pilates in Seattle studio and try our introductory offers. The instructors are always friendly and are expertly trained to cater to all fitness levels. Take control of your health! Drop by Kinesia Pilates today and start learning how the Pilates method can transform your life.